What a year! Plenty of great things happened on Simple Dreamer in 2012. It's time to wrap up this prosperous year. This year, we've reported from 9 cities in almost 70 posts. The number of visitors grew once again and has reached new heights in December 2012. Thank YOU for your support! We will continue to share wonderful happenings from China, Hong Kong, New Zealand, USA, and around the world. See you again next year! It's Boxing Day! We have a present for YOU! On 2010 Boxing day, we brought you Hong Kong's Victoria Harbour. This 2012, we are bringing you Shanghai's Huangpu River: the skyline of Lujiazui District of Pudong from The Bund. Shanghai waitan "The Bund" is a fascinating place that one will never get tired of. On my previous visit, views of Lujiazui were partially blocked by clouds and mists in the air. In a recent visit, I finally get to capture great pictures of Lujiazui, one of Shanghai's fastest booming commercial area. On 2010 Christmas Day, we have presented a video of Hong Kong's Christmas Lights and Displays. This year, 2012, we are presenting Christmas Trees and Lights in Hong Kong and Shanghai! It's 24 December 2012, Silent Night! We have a present for you. A modern Crystal Christmas Tree from Shanghai! Hong Kong property developers have successfully brought commercial Christmas to Shanghai. If you happened to be in a major shopping districts such as Xujiahui, simply walk into one of the shopping malls and seek giant Christmas decorations. If you can find something stunning or at least huge, you are most likely visiting a shopping mall operated by one of Hong Kong's property developers. Twenty years ago, who would have thought that Shanghai would be full of modern shopping malls? Who would have thought that Shanghai would put up Christmas trees, lights and decorations to celebrate Christmas? Thanks to the open policy, Western culture has influenced China's major trade port, Shanghai, once again. Apart from the fact that there are a growing number of Westerners in Shanghai, property developers from Hong Kong helped to bring the modern Christmas culture from Hong Kong to China. In addition to a pair of huge deer and their winter wonderland, the IFC mall at Central of Hong Kong has also installed a few pieces of temporary art display. These displays looked great and has certainly lightened up the shopping mall. However, I failed to find any descriptions or a theme of these scattered masterpieces. Have you ever wonder, how would the wonderland of "Alice in Wonderland look" like in real life? This Christmas, indulge yourself in this real life wonderland at Hong Kong's one and only Harbour City! Simply visit Harbour City's LOVE is All Around Christmas decorations. We have previously report a piece of art on permanent display at the K11 shopping mall in Tsim Sha Tsui of Hong Kong. It is Mona Lisa Mosaic made with Toast! An inflatable art named LOVE ME! 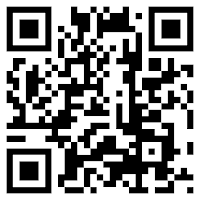 is currently on display at the most artist shopping mall in town, the one and only K11 of Hong Kong. K11 is the name of the shopping mall, and LOVE ME! is the name of the inflatable pig. This art piece is unique as it constantly inflate and deflate to symbolise the cycle of life. One of the best designed and operated shopping malls in the Tsim Sha Tsui area is definitely The One. Yes, The One is its name. In this day and age when malls are competing to put up the best Christmas decorations to attract Christmas shoppers, The One has decided to join forces with To-Fu Club. What on earth is To-Fu Club, you may ask. What has a character based on Tofu do with Christmas? First of all, for those who don't know what is Tofu, it is a Chinese food made with coagulating soy juice. Tofu itself usually offer little taste. It's texture is soft and yet solid enough to offer an unusual party in ones mouth. Today is the twelve day in the twelve month of the twelve year of this century. Plenty of couples choose this memorable date 12.12.12 to get married. We would like to celebrate 12.12.12 by formally presenting this year's SimpleDreamer Christmas Special! It's simply impressive to see a true winter wonderland inside a shopping mall. IFC mall, short for International Finance Centre, at Central of Hong Kong did just that. The center piece of the winter wonderland is a pair of huge deer. I am not an expert in fake plastic deers, but this pair is certainly an unique breed. We have shown you pictures of the giant Tiffany Christmas Tree from Hong Kong WinterFest 2012 in a recent post. We thought you haven't seen enough of the Tiffany Christmas Wonderland in Statue Square of Central from those evening photos. We have revisited the Christmas Wonderland during day time! It is without a doubt that the Tiffany Christmas Wonderland looks much better at night with lights on. However, it is much easier to see the efforts event organizers put into decorating Statue Square under daylight. Hong Kong is a city full of advertisements. This is particularly true in key shopping areas such as Causeway Bay on the Hong Kong Island. The Korean electronic giant Samsung sponsored the Hong Kong Concert of Korean boy band BigBang. Although Korean boy band has its niche in Hong Kong, they are really not that popular amongst most locals. Hence promotion is necessary. A set of promotional materials are currently on displayed at prime location in the Causeway Bay shopping area. It's Christmas! Shopping malls, or self claimed Shopping Complexes, cooperate with known consumer brands and setup Christmas displays to attract shoppers. Every year, iSQUARE shopping mall at Tsim Sha Tsui offers something special. This 2012 Christmas, iSQUARE has erected a giant Ferrero Rocher Christmas Tree at its door. Since its humble beginnings, iSQARE has always been a huge supporter of erecting giant displays to seek attention. Perhaps for some bizarre reason, the shopping mall Olympian City in Hong Kong has decided to mix a Canstruction event with its Christmas decor this year. While it is pleasing to see big and small structures made of cans in the shopping mall, most exhibits don't quite match with the Christmas theme. A green tea company saved the day! Big and small Christmas trees made of cans of green tea tied Canstruction together with Christmas. All the shopping mall needed was a backdrop that somehow promote the Christmas theme. Canstruction, a food charity event, is currently happening at the Olympian City in Tai Kok Tsui district of Hong Kong. Teams piled up cans to create artistic structures in this local shopping mall to attract awareness and "giving hope" to ones who needed. A huge pig made of canned food! According to the organizers of "Olympian City x Food Angel – Christmas canstruction® Hong Kong", the canned food on displayed will be donated to local food banks. While it is a nice gesture to do so, it is highly suspicious that the choice of cans used were limited to only the brands of the event sponsors. How to fly from Shenzhen to save money? How to go to Shenzhen Airport from Hong Kong? How do I enjoy the benefits of cheaper domestic flights in China by flying from Shenzhen instead of Hong Kong? Life is about exploring new things and new ways to do the same things. Are there certain things in life that you have heard about for a long time but never tried? To me, my friends have been talking about the benefits of flying from Shenzhen Airport to cities in China. That's right, in most cases, air tickets from Shenzhen is much cheaper than flying direct from Hong Kong. The Hong Kong Tourism Board and Tiffany & Co. put together a 18-meter-tall giant Christmas tree at the Statue Square in Central Hong Kong for this Christmas. The Status Square has been transformed into a Tiffany Christmas Wonderland with giant outdoor displays and Christmas lights in this Hong Kong WinterFest 2012. The center piece is of course the Tiffany Christmas tree. Apart from the giant Christmas tree, a collection of giant Tiffany gift boxes in the brand's signature Tiffany Blue are very eye catchy! There is even a merry-go-round next to one of these boxes! Langham Place, a shopping mall in Portland Street of Mong Kok in Hong Kong, hosts regular small to medium sized exhibitions. There is of course no exceptions in this holiday season. This Christmas, you can find a small jungle of white glowing Christmas trees at Langham Place Mongkok. Theme around white Christmas, white trees and houses made of plastic and LED warmed up one's heart. According to Langham Place, displays in the Illuminated Forest are supposed to be 4D: stimulating ones sight, touch, sound and smell. This is the 250th post of our Simple Travel Blog! Since its humble beginnings in October 2010, Simple Travel Blog has plenty to celebrate. Our most important achievement is of course your continuous support. Thank YOU! We are setting new goals to achieve new heights. We will continue to travel, continue to share and continue to be simple. 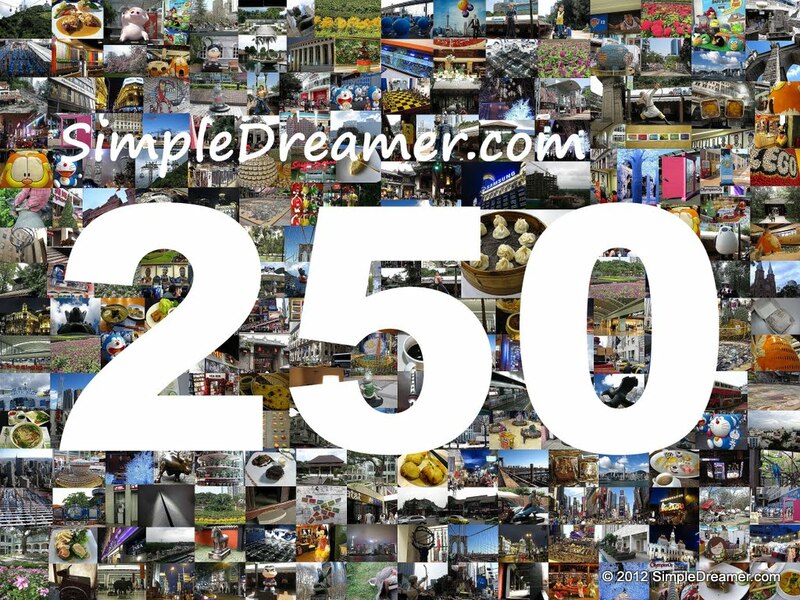 Let's ride on the journey to Simple Travel Blog's 500th post together! In memory of one of the smartest and brightest man in Chinese history, Zhuge Liang, the Wuhou Memorial Temple in one of key attractions at Wuhou District of Chengdu City in Sichuan Provence of China. There are plenty of online resources on the Marquis of Zhongwu, the state chancellor of "Shu Han" Kingdom during the Three Kingdoms period, a period when landlords, warriors and strategists competed to rule China. In Chengdu City of China, next to the historical Wuhou Memorial Temple, there is an Ancient Chinese Street called Jinli. Literally translate to the "Lane of Bright and Beautiful", Jinli or Jin Li is a street full of traditional Chinese houses hosting shops that offer Chinese food and souvenir. This Ancient Street felted a bit commercial, especially when I saw a Starbucks shop coated with a traditional Chinese exterior. However, when compared with places such as Tianzifang in Shanghai, Jinli felted more "traditional" than Tianzifang. Chengdu, the capital city of Sichuan Provence of China, is a history rich city. It played an important role in the Three Kingdoms period (BC 220–280) in Chinese History. Named after a legend in Chinese History, the Wuhou District in Chengdu is a partially history rich area. Wuhou, short for the Marquis of Zhongwu, was the title given to one of the best strategist in his era. Often considered as one of the smartest and brightest man in Chinese history, Zhuge Liang was the state chancellor of "Shu Han" Kingdom during the Three Kingdoms period. Just when one have little expectation of a domestic airport terminal in an inland Chinese city, Chengdu Shuangliu International Airport left an exceptionally good impression. It is so good that it gives a wow upon arrival, and it leaves a wow before departure. I did not have a chance to see the International terminal of Chengdu Shuangliu International Airport, I would imagine that it would be either as good or better than its domestic terminal. Search for photographs of the exterior of this airport and you will understand what I mean. It's huge! It's Garfield! To celebrate this Christmas, Maritime Square at Tsing Yi District in Hong Kong put on a huge Garfield figure. It is part of Orange Christmas 2012 Garfield x Panda-a-Panda Christmas decorations. This two stories tall cat face has certainly up-lifted the spirit of this MTR shopping mall. Although workers are still installing final pieces of this temporary display, one can clearly see Garfield is covered in patches of snow. Once completed, it would offer plenty of photo opportunities for shoppers. As the slogan of the display puts it, it's time for an Orange Christmas! Those of you who have been following our blog would know that I am a strong believer in tasting food at the country where it originated. Every city that I have been to, every city that I have visited, most of my time would be spent on tasting its local food. Hua Hin Night Market is one of the must go places when you are in this part of Thailand. The other three alternatives are: go back to hotel and sleep early; hang out at pubs; or attempt foot and body massage. A visit to the night market is probably the only night activity that suits the whole family. Located at Hua Hin city center, Hua Hin night market is just 3 minutes walk from the clock tower; 10 minutes walk from Hua Hin beach. The night market is centered around one street, Hua Hin 72, and stretched along two blocks. Groceries and food stores are scattered in near by open areas. Thailand is one of the countries where you can find Asian elephants. It is an unique experience to ride on these giant animals in the bushes. Hua Hin elephant rides can be organized by the hotel you stay in. The elephant place we visited provide pick-up from hotel, one hour elephant ride as well as a mini elephant show. The ride began with the sound of unique footsteps. A two meter elephant appear from just round the corner with a driver on its head. We walked up a wooden staircase to a platform, where we can move to a basket tired on the back of the elephant. The seats are made of wood that hurts our bottom, the "safety belt" was as loose as a goose. These didn't matter because the journey has begun. Hua Hin, a name that may not be familiar to most travellers. It is one of the holiday destination of Thailand in Asia. It has a beach tho it is not magnificent. It has a night market tho it is not unique. It has got a tourism and hospitality industry but it is not known for its size. The only selling point of Hua Hin is simple. It was the place where the Thailand royal family spent their holidays. Yes, it "was". Compare to other well known Thailand holiday destinations such as Phuket and Chiang Mai, Hua Hin has a long way to catch up. One of the popular posts of Simple Dreamer features a cosplayer dressed as the Iron Man at the 2010 Asia Game Show. Although Iron Man is certainly not the most popular super hero in Hong Kong, we did came across this graffiti recently. A trip to Shanghai is not complete without tasting its famous dishes: xiaolongbao and shengjianbao, unless you are vegetarian or you cannot eat pork that is. I had several attempts of "genuine" xiaolongbao and shengjianbao during my stay at Shanghai. I must admin I was a bit addicted to these local food. There are of course plenty of other choices. These two are famous for their unique shapes, tastes and presentations. Furthermore, they are at absolutely affordable prices (very cheap in deed) and in snack servings. You would have plenty of stomach spaces to taste other food. In 2010, the whole of Shanghai and most of China has gone all crazy about something called World Expo. On the surface, the original intention of World Expo is to introduce the different nations on this planets to visitors of the hosting city. The Chinese of course saw this differently. They saw it as the chance to show off the magnificence of China to the world. What really happened was, the majority of visitors were from different corners of China. These local visitors travelled to Shanghai and saw how well China presented itself to the world, while dreaming that all foreign visitors would admire China's greatness. While this could be true, foreign visitors were the minority. World Expo has successfully archived its actual purpose: showing the world to the locals at the hosting country, while keeping them excited about the greatness of their own country. It is without a doubt that Shanghai has changed a lot in the past ten to fifteen years. Apart from being more open, modern, developed and rich, it has ever more energy. Foreign tourists and expatriates came from the West to experience Shanghai, while influencing how Shanghai redefined itself. If you ask the old fashion folks in Shanghai, they will tell you that Shanghai has been losing a lot of its "old" streets and buildings in the past ten to fifteen years. These old districts that carried more than memories are now modern buildings. The Bund of Shanghai, most common known as the waterfront of Shanghai, or Shanghai Tang, is a thin strips on land next to the river banks of Huangpu river opposite Pudong district. Hundreds of western styles historical buildings built in late 1800s became treasures in today's Shanghai. These buildings are evidence of trade and settlement between China and the Western world. Every world class city has its famous main streets and shopping areas. New York has its Broadway and 5th Avenue; London has its Oxford Street; Hong Kong has its Nathan Road and Canton Road. Shanghai has its Nanjing Road. Literally translate to the road of Southern Capital, Nanjing Road is pretty long road. It is divided into different sections that stretches through different subrubs. If you have limited time, consider to visit the Nanjing Road Pedestrian Street near the People's Square underground railway station. We blogged about Hong Kong Heritage Discovery Centre in February 2011. For some bazaar reason, something escaped from our eyes during the previous visit. We have recently revisited these former Whitfield Barracks at Kowloon Park. To our surprise, we have discovered a decent size public gallery on Chinese history. While we still couldn't believed that we have overlooked such treasure, we tried to comfort ourselves by suspecting that the gallery was setup recently. The Ocean Park is a legend in Hong Kong! It is a theme park that fought its way against all odds. It is definitely a successful business story of all time. There are probably numerous travel blogs that introduces the must-go and must-see attractions in Ocean Park. Let me introduce Hong Kong's local theme park from another angle, begin with its business story. Inspired by Hollywood Boulevard, several Hong Kong Government led organizations set up the Hong Kong Avenue of Stars at the waterfront of Tsim Sha Tsui to honor celebrities from Hong Kong's movie and entertainment industry. Perhaps encouraged by the success of Avenue of Stars, the Hong Kong Government decided to sponsor the set up of the Hong Kong Avenue of Comic Stars at Kowloon Park. Of course, the official reason is to foster the development of the comic industry in Hong Kong. Huge plastic figures are erected at Kowloon Park as permanent display. A stunning 3D painting of Qin Terracotta Army is currently displayed at the Hong Kong Museum of History. This enormous painting is a promotional piece for The Majesty of All Under Heaven: The Eternal Realm of China's First Emperor Exhibition that runs from 25 July to 26 November 2012. This is a temporary exhibition at Hong Kong's Best Museum. One can tell the importance and scale of this exhibition by looking at it's promotional materials. As the official site is nicely done, I shall focus on the brilliant promotional materials. The capital city of Thailand, Bangkok, have a world class airport! According to the local that is. The Suvarnabhumi Airport (สนามบินสุวรรณภูมิ in Thai), known as the "new" airport in Bangkok, recently had its 6th Anniversary. I recalled my visit to this airport around five years ago. Although memories are fading away, I did remembered clearly that it was the only airport I have ever been to that broke my luggage. I also recalled the modern yet impressive architectural designed. Despite of breaking my luggage, I was very impressed until I came to the arrival hall. Unless you have been living in a stone cave, the name Angry Birds would not be foreign to you. Unless you have lived in Hong Kong, you would think that I misspelled welcome in the post title. 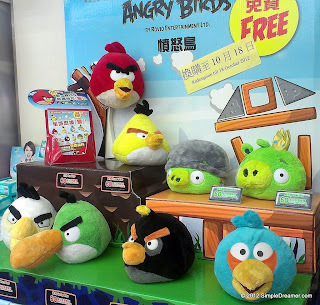 Angry Birds need no introduction; and Wellcome is a major supermarket chain in Hong Kong. Angry Birds have landed in Wellcome! You have GOT to "Like" the number of public holidays one can enjoy in Hong Kong! In this 2012, 30th September happens to be the 15th day in the 8th month of Chinese lunar calender. The folks here in Hong Kong are granted a day of public holiday to celebrate a traditional Chinese festival: mid-Autumn festival on this day. One of the MUST-DOs in Vietnam is to taste its local cuisine. Vietnamese rice noodles in soup (Phở in Vietnamese) is an excellent choice. The popularity of "Pho" can be represented by a T-shirt I saw in Ben Thanh Market that reads "iPho" (as in brother of iPhone). They are not to be confused with the Chinese egg noodles that you might have tasted before. Vietnamese noodles are made with rice and can easily be distinguished by its pure white colour. Furthermore, their texture are tender yet soft. Why did the chicken cross the road? To get to the other side of the road, of course. How did the chicken cross the road in Ho Chi Minh? Probably by pure luck. One of the notable and obvious phenomenon in Ho Chi Minh City of Vietnam is the overwhelming number of motorcycles on the road! They are everywhere! According to the locals I have talked to, almost everyone in Ho Chi Minh have a motorbike. Motorcycling has GOT to be the favourite mode of transportation in town.